Yay.com are delighted to announce that we are now an accredited ICANN domain registrar, with more than 500 domain names now available at the UK's lowest new registration, renewal and transfer prices. Continuing the mission to provide easily attainable and affordable services for businesses, Yay.com's domain registration offering sits alongside its state-of-the-art hosted VoIP phone system. The addition of a domain name search and registration platform gives customers the key ingredients needed for both an offline and online business presence. The team at Yay.com have over 50 years combined working knowledge of the domain industry so customers can be confident that they will receive the same thought, care and service with this new domain offering as they have come to expect with the Yay.com hosted VoIP service. With a range of powerful domain management features and bulk domain tools, we hope customers will find managing domains a smooth and simple experience, whether they own one domain name or one thousand! Web agencies, developers or hosting providers that are used to managing multiple domains for clients will find that they are catered for with bulk management options such as bulk registration and transfers, bulk contact management, and DNS templates and Nameserver groups for frequently used settings. Domain labelling and filtering helps ensure organising domain portfolios is just that little bit easier, plus domain data exports make sure that all key domain name information, such as expiry dates and statuses, is available at the touch of a button. As well as bulk DNS templates, powerful DNS controls include TTL management, wildcard and DNS record creation such as CNAME and A records. Whether masking or redirecting a domain name to an Etsy shop or Ebay store, forwarding domains to different web addresses with us is also a straightforward process too. With options to set default contacts and nameservers, buying and registering new domain names is also a hassle-free process. With a free privacy service included, customers can also take peace of mind that their registrant information will remain private and protected. Managed renewal options minimises the risk of losing domains due to expiry too. Find out more about some of the features available to you at our domain features page. If you own a domain already transfer in and try us out today. 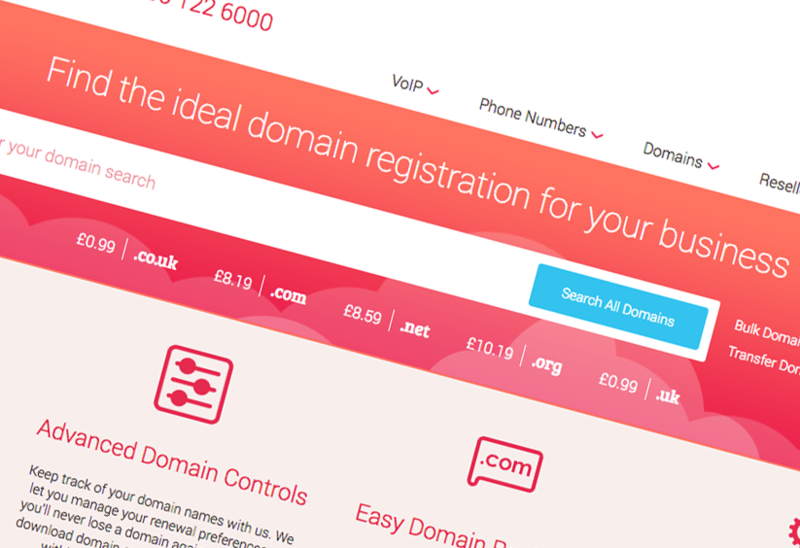 Alternatively, don't miss out on the perfect web address, use our domain name search to find the perfect domain for your business or personal project from our huge range or extensions!